The Jacksonville Landing is a festival marketplace in Downtown Jacksonville, Florida. It is located at the intersection of Independent Drive and Laura Street, along the Jacksonville Riverwalk. It was built by the Rouse Company at a cost of $37.5 million and opened in 1987. The 126,000 square feet (11,706 m2) center is comparable to New York City’s South Street Seaport, Boston’s Faneuil Hall and Miami’s Bayside Marketplace, all developed by Rouse. The Jacksonville Landing was designed and built by the Rouse Company, who developed a number of similar structures in other cities. It opened its doors on June 25, 1987. The Jacksonville Landing hosted a week-long celebration featuring a drum and bugle corps, balloon release, community choirs and national acts. The Rouse company partnered with City of Jacksonville, who contributed $20 million toward the construction of a festival marketplace that would revitalize the city’s core. The entire second level of the main building was devoted to the Founders Food Hall, a food court with 18 restaurants. The decor featured silhouettes of 17 individuals who had a role in the settlement of North Florida. Outside seating included a view of the center courtyard fountain, stage, and the river. However, anticipated foot traffic never reached projected numbers and within four years, one third of the food court tenants closed. The west side of the food court became a video arcade named Ostrich Landing. The Landing’s first bar was Fat Tuesdays, which offered frozen alcoholic beverages. The business attracted a mostly younger clientele, and the Landing management decided not to renew their 10-year lease when it expired, citing a desire for an "older crowd". In 2003, the Rouse Company announced it would sell the Jacksonville Landing to local developer Toney Sleiman for $5.1 million. The Florida Times-Union revealed that Sleiman, who bought the buildings but not the city-owned land, would not have to pay the $100,000 rent required by the City of Jacksonville for the land until the city provided the 800 parking spaces it had promised the previous owners. In 2010, the 23-year obligation was finally resolved. The Jacksonville City Council passed a bill to contribute $3.5 million toward Sleiman’s purchase of an existing parking lot across from the Landing. That money included a 20-year parking validation program at a cost of $2.5 million to the city. Mayor John Peyton vetoed the bill, but the council voted unanimously to override the veto. 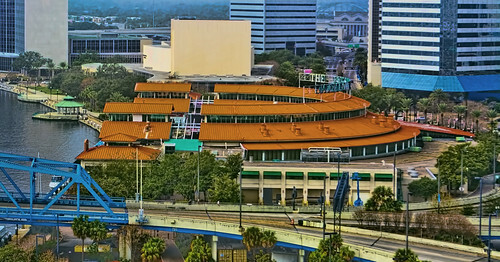 The two-level glass-and-steel complex with the orange roof is located on the north bank of the St. Johns River. The 9-acre (36,000 m2) complex features 65 stores as well as dining, with full-service restaurants plus a food court, and entertainment. The Landing stages a variety of special events. There is weekly live music on the courtyard stage. Most events take place in the open brick courtyard in the center of the horseshoe shaped structure. Just before the Georgia-Florida football game in 2007, the Landing installed a 19×15 foot JumboTron in the courtyard. The Jacksonville Landing (usually referred to as just the Landing by locals) has a local patronage base of over 65,000 Downtown office workers and over 1,000,000 residents in the surrounding metropolitan area of North Florida. According to various Florida travel sources, it has been "an icon" for Jacksonville and "one of the most recognized attractions in Northeast Florida" since it opened in June, 1987. Downtown Improvement District (DID) for Jacksonville claims it is a popular tourist destination. The Landing hosts more than 300 events each year including Florida/Georgia Weekend Celebrations, the annual Christmas Tree Lighting, New Year’s Eve and Gator Bowl Celebrations, St. Patrick’s Day, the Jacksonville Jazz Festival and July 4th fireworks. Weekly events include year-round live entertainment in the center courtyard every Friday, Saturday and Sunday. The bands offer a variety of music including classic rock, oldies, contemporary, jazz, and top 40. The Landing also hosts national country concerts and classic rock concerts in the spring, summer and fall each year. In September, 2010, The Landing announced a partnership with Downtown Vision to host an every Friday Farmer’s Market from 10am to 2pm. The market was relocated from Hemming Plaza. Since relocating to The Landing the market has been a huge hit with patrons. The market averages over 40 vendors each week. The Landing also hosts a myriad of events for the community such as charity walks and runs and the Earth Day Ecology Fair. The Landing allowed the Jacksonville Maritime Museum to use unoccupied retail space to display their collection of large scale model ships for seven years, beginning in 1990. It was a positive for both parties; the museum increased their exposure with a free venue and the Landing filled an otherwise empty storefront and offered a free attraction to increase foot traffic. Jacksonville Maritime Museum Society President John Lockhart explained, "Every time they would get a new tenant, they would move us to another empty space." That situation occurred five times in seven years, but in mid-November, 1997, the museum was given seven days to vacate in preparaton for a new tenant. "This time, they just ran out of empty space," commented Lockhart. Many exhibits were put into storage. In October 2011, the museum was invited to return to the landing, and was given a large space to use. Their former home on the Southbank of the Riverwalk was demolished as part of a larger renovation that included Friendship Fountain. In the spring of 2010, the Jacksonville Landing was the object of a workshop during the American Planning Association’s yearly conference. Participants were challenged to reinvent the facility without constraints. Ideas were shared with the property managers and owner Sleiman, who was impressed with their vision. Suggestions included slicing a wedge from the landing to open up access from Laura Street, closing the western ramp to the Main Street Bridge and rerouting Laura Street through a roundabout, and adding a marina and other buildings, such as a hotel.